Are you making this huge mistake when reaching out to the press? Here’s how to take the right approach for better results. Collage of artwork by Kelly Dombrowski. Alcohol ink on Yupo paper. 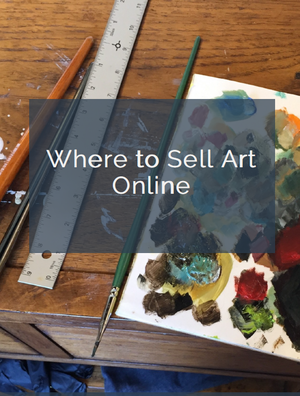 As an art blogger who publishes frequent business articles and features, I’ve been a “press member” for years – and I’ve been contacted thousands of times by artists and others who are seeking publicity for their artwork, project or event. That means pitches and inquiries come into my inbox every day. Lots of them. And honestly, although most of the people who get in touch are probably very nice people, they are making a fatal mistake when it comes to getting press attention. They are using a “scattershot” approach and not taking the necessary time to customize their emails. Here’s one example: the email (usually through my contact form) that starts with “Hi there” or no greeting at all. It’s from someone I don’t know who wants me to read their message, click on all their links, and take some kind of action – for example, creating an article about them or inviting them to write a guest post. Now I know full well that “Hi there” means they don’t know my name (which is easily found on my site) and they probably know nothing about the blog. The sender is using “copy and paste” to reach out to everyone on a list that they obtained. These are form letters sent out to serve the interests of an artist seeking some free publicity. Essentially the sender wants to minimize the time they take to seek press coverage, and are using their form letter to ask the press member to read their content, view their portfolio, and decide to undertake a project to their benefit. They want to send a quick, generic and impersonal “copy and paste” message, but want they want in return is a time-consuming and customized result. That rarely works, and ends up as a major frustration to both the artist and the press member being solicited. If you’ve undertaken this kind of campaign to get some press, I’m going to suggest that you make some changes. Instead of sending out emails to lots of bloggers or reporters, start cultivating relationships with members of the press you have selected because you respect them and they are a good match for you as an artist or maker. Think about it – how many times have you responded to junk mail in your mailbox? Wouldn’t you rather receive a handwritten note from a friend? Identify those blogs, publications, and websites that are right up your alley, and that would be a perfect match to help you gain publicity. Then, follow them. Subscribe to their blog, connect on social media. Perhaps get into a discussion group online where you can get to know these people better. Reach out to know more about them before you ask them to learn more about you. Become a part of their network. Why? Because when reporters and bloggers (and everybody else for that matter) get to know you, they are more receptive to hearing from you. They already get enough “hit and run” press solicitations to choke a horse, and are tired of hitting the delete button. Don’t be that person. Be a supportive and active member of their network who responds, shares and enjoys their content. And, hopefully, you will be someone who is a source for them, too. Then what happens? Well, the artist may get a bit of publicity when least expected. Take Kelly Dombrowski, for instance, whose lovely artwork graces this post. She’s in my network and shared her work in a Google+ group. I asked her if I could use her images in a business article (because who likes stock photos, anyway? Art is much nicer.) She graciously said yes, and I promised her a little link love. So please give her art website a visit – you can find it right here. Have you developed ways to connect with the press that got you great results? Please share. Gulp… well maybe I’ve done this scattershot thing once or twice… But now I know better! Thanks as always for the sage advice Carolyn! That’s OK, Peter. Thanks for admitting it, because I think many others have done the same thing. I do think when you start cultivating a network, you’ll find your messages will be well-received. I haven’t yet reached out to the press or other bloggers…but this is really great advice. I’m sure galleries have to deal with the same issues. I don’t get why some artists don’t take the time to cultivate relationships…for me, because I do take the time, I have gotten so much repeat business and developed new and wonderful friendships because I take an interest in them as well. Kathryn, I think you read my mind …. galleries do indeed deal with submissions from artists who come out of the blue and expect consideration. Although I cannot speak for other bloggers, I work exclusively within my network for content and guest posts. Thank you, Carolyn! This is great advice. It is very time consuming to personalize emails and cover letters, even artists statements at times, but well worth the extra time and energy. Thanks for your comment. It’s true that the extra energy is worth it. I think that anything personalized matters. Just the other day I published this article about customer service http://www.artsyshark.com/2015/02/26/how-to-create-an-amazing-customer-experience-for-your-collectors/ and I think it works with just about anybody!! From one writer to another I applaud you for another informative and necessary article. Thank you! I will share it and hope the people who really need to read this will pay attention and reap the benefits of your sage advice. And from one writer to another, thank you, Renee! You are an important part of my network. I love to have good relationships with other artists and I love to help them when I can. I guess this paid off! I always wondered how people were featured or wrote articles :D. You are a pleasure to have in my network Carolyn! Very timely article. Thank you so much for enlightening us all. You chose well with Kelly ….. love her art. Oh gosh! Thank you Mary! It is great to learn of you here. Very impressive About page and eye opening. I would like to learn more about your experiences. I ALWAYS search to address someone by name and seek to learn about them and how to build a relationship. I just have not know who or what press sources are out there. I am Kelly’s friend and found this place through her wonderful post on Facebook. That is really encouraging to hear she got featured here. Way to go, Kelly! How can I connect with you, Carolyn, and just get to know you over time? I already signed up for the emails. This site looks exciting. Very nice article, politely written, that shouldn’t have to be written, but guess it serves some good. Thank you again for this page. Hi Ruth, What you are doing by commenting on a blog is a way to connect with press (and your network). And since you belong to online groups, you have more opportunities. I will be posting an article tomorrow about how to start to generate press attention, beginning right where you are now. Great suggestions given by the experienced blogger, A must follow points for all the artists who are seeking publicity for their artwork that how to contact and build network with press people.